This was THE day of days. We started with “Free Time” in Ypres but with crowds already seemingly gathering we decided to go straight to the Menin Gate. and pick out a prime position so we could be as close to the ceremony as possible. Waiting there the enormity of the occasion suddenly hit us. Pictures were being taken everywhere you looked and there was a sense of pride and also tragedy as we stood there waiting for the parade to begin with people jostling around us trying to get into an advantageous position. There were people obviously inside the Menin Gate, they were also stood on the grass verges outside it and down the streets on both sides as well as up on top of it looking from their high vantage points down the crowded streets which had thousands of people stood behind barriers in them. I recorded the parade as they went past us into the gate and felt a great sense of occasion and also a weight of responsibility as the troops marched past. As the service began there was a deep hush throughout the watching audience both inside and outside the gate. At the end of the service thousands of poppies poured through the roof of the gate and fell to the ground in silent tribute to the fallen men that we were there to commemorate. This brought a very big lump to my throat as I struggled to hold my emotions in check. After the service at the Menin Gate we had some free time to have lunch after which we went back to join our coach to go on an optional excursion. This excursion took in a book fare in Passchendaele village, after this we were taken for a short photo opportunity at the Canadian memorial for the brave men who stormed, and took over, Passchendaele from the Germans. We visited a memorial erected in memory of the welsh soldiers who served in this area and also Essex Farm cemetery where we saw a memorial to the West Yorkshire Regiment and also learnt it was somewhere around here where Canadian doctor John McCrae wrote his famous poem called In Flanders Fields. Once again we also learnt of the true horror of this war as we saw a headstone for rifleman V. J. Strudwick who died on 14th January 1916 at the tender age of 15. We were also told of the origin of the poppy as a symbol of remembrance due to the inspiration of American lady Miss Moina Michael. 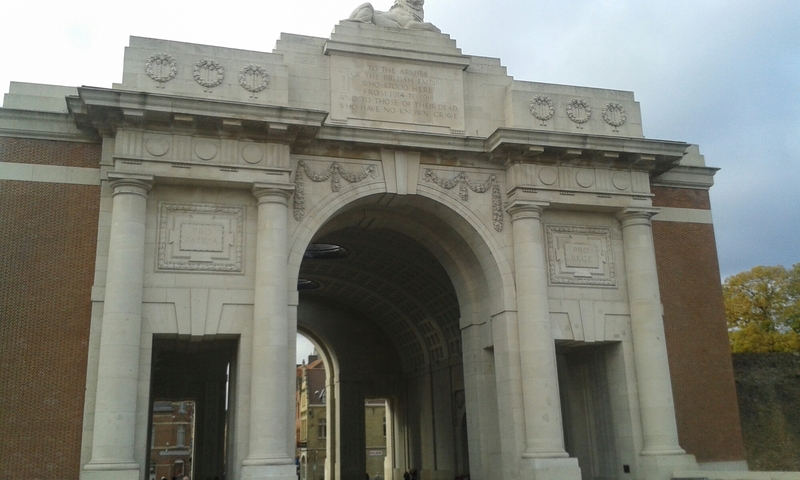 We then returned to Ypres for the Last Post ceremony at the Menin Gate. After some free time in Ypres we returned to the Menin Gate and brought a close to the day attending the Last Post Ceremony. Seeing the gate lit up as magnificently as it was in the evening gave it a new edge and impression on our conscience. The Last Post Ceremony was also very humbling and emotional as was expected and also had a very international flavour with troops from Canada there and the music played by West Yorkshire Police Band, and also marching music from drums and bagpipes. Tomorrow we return home from a very memorable, and extremely emotional and poignant trip. Life will always seem a little different due to this experience.